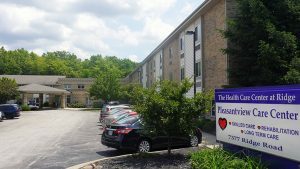 Pleasantview Care Center offers short term rehabilitation, skilled nursing and twenty-four hour nursing home care in Parma, OH with a location convenient to all major highways. We are family owned and operated, and have been serving the community since 1971. Our goal is to provide exceptional person centered care in a nurturing, home-like living environment. At Pleasantview Care Center, our goal is to make each day special. We strive to provide a pleasurable, stress free environment that promotes well-being and a sense of community. Also on our campus is Legacy Place Parma, a full service assisted living. We offer spacious apartments in a safe, fun-filled living environment, with personal, medical and rehabilitation assistance available for our residents to thrive and live life to its fullest. We welcome and allow pets.